Life after Death , Ghosts, Spirits & More. This page will show you various ways to protect yourself & cleanse your home. Above is a Native American Smudge video showing you how to smudge and ways of doing it. Smudge is a very old practice that is still used today by many. If you try this you will feel the energy change almost right away. Cleansing your home is almost the same as personal smudging . You want to get the smoke everywhere within your home from room to room. Why Smudge? Well when we return from a long day burdened with stress, as the negative energy releases from our bodies it dissipates into our surroundings. Overtime this may build up, leaving us wondering why we no longer feel the satisfaction of coming home to our safe comforting environment. Negative energy can stagnate in corners and the dark places in our homes. You may notice your experiencing trouble sleeping or having feelings of anxiety and restlessness. Perhaps a feeling of being watched. You may notice uneasy feelings in certain rooms or arguments always happening in one area of your home. Maybe you just want your home to feel fresh and light again. When I do my readings I always do a smudge first. I use white sage as well as some other herbs such as cedar or blend of 'protection' herbs. I have used this practice for many years now and believe strongly in the cleansing effect it has on me and my 'area'. Get a shell, abalone or scallop shell is what I always use. Any small, flat, heat-proof container will do. Light the sage and let it flame for a minute or so. Extinguish the flame so the sage is smoldering and smoking. Take the smudge container or wand and using circular clockwise movements, encircle yourself with the smoke, asking that all negative energies be cleansed away. You can do this for the whole room and even the whole house. Start at the most northerly room and working again, clockwise, through your home, let the smoke from the sage permeate throughout. Try and finish off the smudging process by ending up at an open door towards the most northwesterly part of your home. You should have come full circle around your home. Doing it this way gives the best results but the important thing is to smudge all area's. A note of interest: this may set off your smoke alarms. 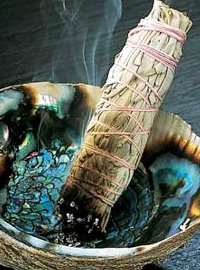 So be prepared to disconnect it during your smudging and be SURE to re-engage it upon completion of your smudging. I say a little Prayer of sorts over and over as I do my smudging, asking the 'powers that be' (Spirits of the sage) to remove all negativity and unwanted energies. You can say anything you like the important thing is to direct the energies at removing all negative vibrations etc. from you and your home. IT WORKS!!! !...when first doing this on a regular basis, you may find yourself feeling agitated or uneasy and not sure why. It is because you are 'clearing' with the help of the smudging. This would indicate that there is a lot of 'negative' energies in your environment. I do not have a set amount of times to smudge. I personally smudge myself and my room once a day, because of what i do, and my home once a week. You will find your own feel for how often for yourself. My daughter & I enjoy the scent of the white sage before bed as well . It is very relaxing and worth trying before bed. Sage is the most potent herb for smudging (White sage or Buffalo sage ) but you can also use cedar and sweet grass. I have a mixture of this that I also burn sporadically for extra strength in removal of unwanted energies. In Sarnia the best place to get the sage or other items needed is Calm n Scents in Northgate plaza. They have a wide variety of items and some very unique. Also Stones N Bones in downtown Sarnia sells white sage and a few native smudge items as well as a huge variety of crystals and natural rock formations.